Transferring files between iPhone and computer is not a difficult task. You can do it using iCloud and Windows default settings. But both methods have their own limitations and may result in unexpected system crashes or missing of files. When talking about iTunes, it can not be installed on a Windows computer. Its interface and settings will create a confusion among the users on how to use. Another disadvantage of iTunes sync is that it will prevent you from playing non-iTunes files on the device thereafter. Do you want to miss a favorite video or song just because of this simple reason? How to transfer/sync iPhone files to a computer (and vice versa) safely? A cross-platform file transfer app is the best option to transfer/sync iPhone files without creating any troubles. You may find a number of such apps in the online market. But it should be easy to use, fast and secure. WinX MediaTrans is a great app to transfer files from iPhone to PC and vice versa without iTunes. Many new/old iPhone iPad users need an easier iPhone manager to transfer/sync their iOS files (photo, video, music, eBooks) to PC, and WinX MediaTrans let them do the iOS files transfer on Windows in their familiar way without any “disappearing” issues. There are many iPhone managers in the market, but WinX MediaTrans is the only stand-alone iPhone manager that lets users flexibly control iOS files without installing iTunes and its components. As I said earlier, it is easy to use and fast which will take just a few seconds to transfer hundreds of 4K pictures stored on your iPhone. WinX MediaTrans is a powerful iPhone transfer app from Digiarty Software, the leading multimedia software provider since 2006. It enables you to do two-way transfer of these things- iPhone photo, iPhone video, iPhone music, iPhone book, and other iPhone files. Once WinX MediaTrans is installed on your Windows computer, connect your iPhone to PC using the original iPhone cable. Step 1, Choose your file type to get the relevant screen. I want to sync iPhone files to PC and opted for photo transfer first. Step 2, Select your photos individually or check the ‘Select All’ option to sync all photos to PC. WinX MediaTrans will show all photos in your iPhone library and sort them by the year. Step 3, Click “Sync” to transfer the photos to PC. Unlike other iPhone transfer apps, WinX MediaTrans will take a few milliseconds to finish the process. It is fast and reliable software to transfer photos from iPhone to PC at this moment. Add Photo is another option that will do the same job in the opposite direction. It helps you to transfer photos from computer to iPhone. Click the drop-down arrow of ‘Add Photo’ menu to expand. 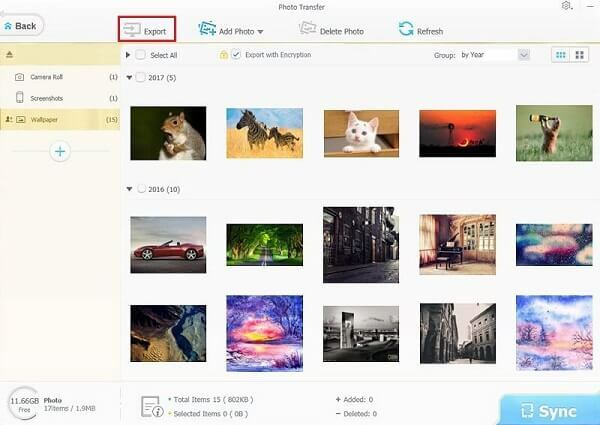 Choose ‘Add Photo’ or ‘Add folder’ from the submenu and select files from your local storage. 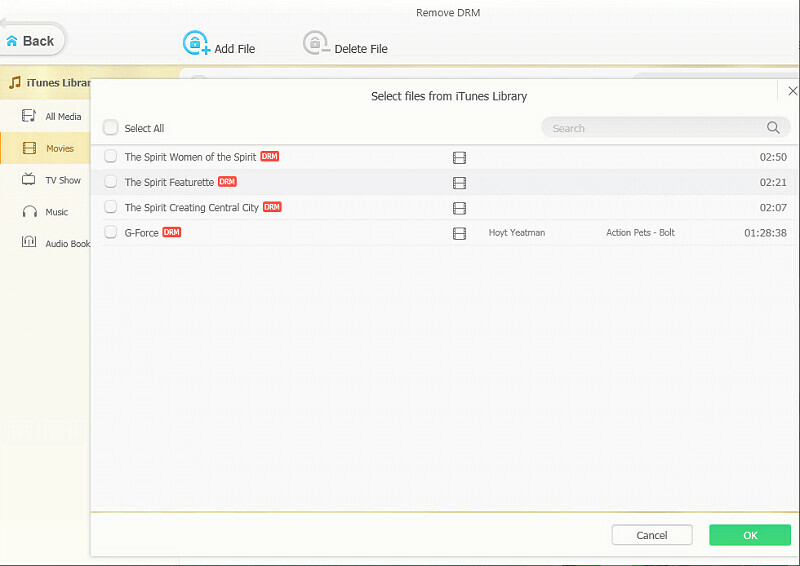 After selection, hit the Sync button to transfer photos from PC to iPhone or iPad. 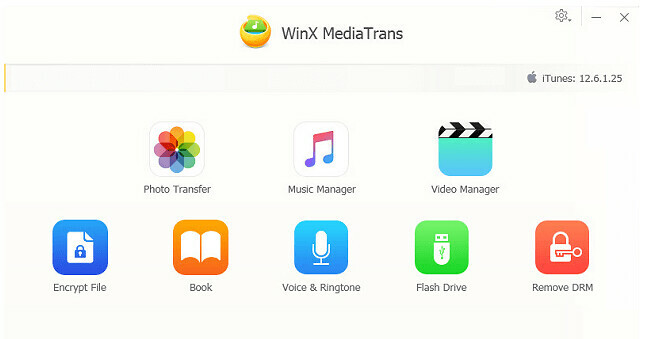 WinX MediaTrans is the perfect app to transfer/sync iPhone files irrespective of their type. It has a clean interface where you can manage iPhone photo, iPhone video, iPhone Music, eBooks, and others without iTunes. Password protection is a notable feature of WinX MediaTrans. It is useful to protect your private photos and files and prevent others from opening it. Choose ‘Encrypt file’ from the home screen to begin. 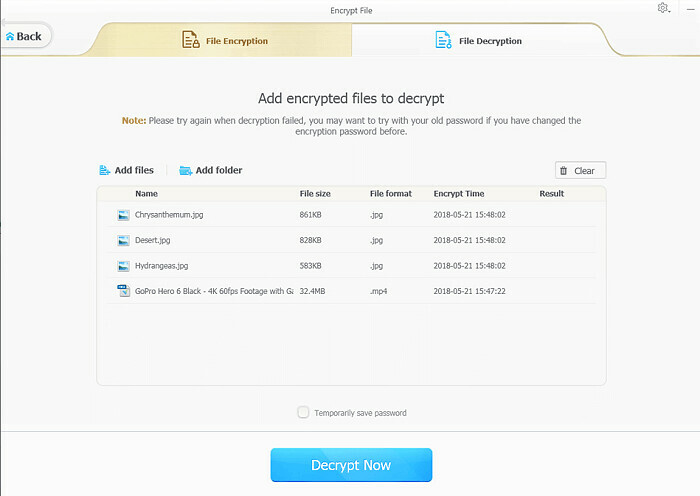 Now you will get options to add files or folders that you want to encrypt. Choose them from your computer and click the ‘Encrypt Now’ button. A pop-up window will appear where you need to enter the password for the file. But keep in mind that losing password will result in data loss and you can’t recover such files in any situation. To decrypt an encrypted file, choose the File decryption tab from the top. Choose Add files or folder option, enter your encryption password in the pop-up box and hit the Decrypt Now button. Done. The encrypted files will be opened in seconds. iTunes sync doesn’t allow you to play non-iTunes media files on iPhone and iPad. But WinX MediaTrans lets you transfer non-iTunes media to iPhone and automatically convert audio to MP3 and video to MP4. It can unchain your iTunes files and enables you to play iTunes movies, music and others on any device including Windows computers. iPhone ringtone is another part where WinX MediaTrans can bring advanced customizations. You can easily choose a music file in your PC or iPhone and set it as your iPhone ringtone with the app. 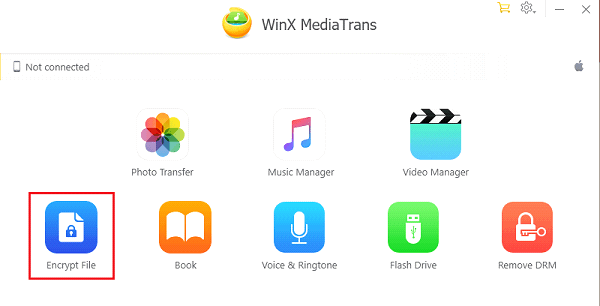 Install and use WinX MediaTrans to transfer/sync iPhone files to a Windows PC. 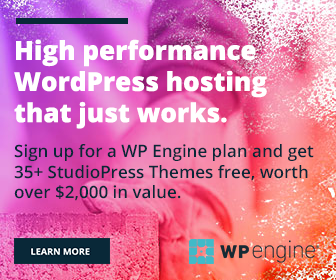 It comes with most modern features to transfer and manage files without erasing the data and also, the advanced encryption protocols to safeguard your contents from unauthorized usage.